Note: this product does not provide software CD, only provide a software download link. 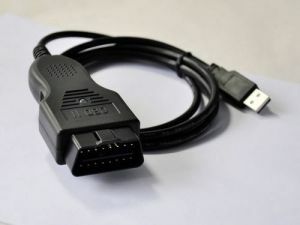 VW/AUDI Diagnostic Cable Lastest version: VW/AUDI Diagnostic Cable V11.80 diagnostic cable. Supports Measuring Values, Output Tests, and Adaptations on control modules using the new UDS/ODX/ASAM protocol. Adds new UDS addresses and updated ODX data for 2010 models. Includes support for TP1.6 protocol which is required for the 6J Ibiza and speeds up access on many modules in other models. The Select Control Module screen now shows "Installed Modules" rather than "Common Modules" if the car being worked on is new enough to have a proper CAN Gateway. Modified SRI Screen to show more info and force user to select a job before proceeding. Adds drop-box function selection in Basic Settings and Adaptation. Reads Mileage stored in many EDC16 ECUs. New CODES file, now with over 13, 000 fault code and measuring value texts. New USB drivers for enhanced PC compatibility and stability. New firmware for HEX interfaces required for compatibility with 6J Ibiza Updated Label files; Better documentation for new and existing models. Compared with the 812, the 908 has its biggest advantage. It lies in that the 908 can match Airbags under the protocol of UDS while the 812 can only read code, erase code and do coding, and it cannot match airbags. The new models that the VW launches now or in the future, such as New Bora and Lavida, will all use UDS protocol. But the VAS5054 in the market nearly doesn’t support UDS protocol Interface opened and tested in a VW Passat B6 2007. 11.80 diagnostic cable Supports Measuring Values, Output Tests, and Adaptations on control modules using the new UDS/ODX/ASAM protocol. Adds new UDS addresses and updated ODX data for 2010 models.